In 2008 she released her second album ‘The Violet Hour’ which was followed by a swathe of glowing national reviews, with the album going on to be one of Mojo’s top ten folk albums of the year. The new year saw Jackie walking away with two BBC Radio 2 Folk Awards including the Horizon Award for best newcomer. Newly signed to One Little Indian Records, on September 7th 2009 Jackie released ‘Hyperboreans’, produced by her brother Jim Moray and featuring a title track written for her by Alasdair Roberts. Her uniquely beautiful vocal came to the fore throughout the album adding a new freshness to her sound. The first single from the album, a cover of the tantalisingly weird song ‘Birthday’ by The Sugarcubes, garnered a splash of mainstream radio play including repeated plays on John Kennedy’s X-Posure on XFM, daytime play on Cerys Matthews 6Music show and late night Radio 2 play on Steve Lamacq’s show. The release of Hyperboreans in the UK was followed by Jackie’s first national tour of England in October/November 2009 with support from Arts Council England. The album was then released in Europe, Japan and Australia in November 2009. The end of 2009 saw Hyperboreans receive a nomination for the fRoots Critics’ Poll Album of the Year, reach number 5 on the Mojo Folk Album of the Year Chart and nominations for the 2010 Folk Awards for Folk Singer of The Year, Album of the Year and Best Traditional Track for ‘Isle Of France’. In 2010 Jackie performed at SXSW in Austin Texas, and guested with The Imagined Village as well as performing on main stages at some of the most important folk festivals in the UK including Cambridge Folk Festival. She was asked to become a permanent member of the all-star fusion band Imagined Village alongside Eliza Carthy, Simon Emmerson, Martin Carthy and more. Early in 2011 she was invited to take part in the Cecil Sharp Project, a song writing house project initiates by Shrewsbury Folk Festival and supported by EFDSS which brought together English and Appalachian musicians for an intensive week of song writing in a house in Shropshire followed by three concerts and the recording of a live album which went on to receive a 5 star review and Top Of The World rating from Songlines magazine. The same year Lush, the nationwide chain of 700 stores selling handmade soaps and cosmetics, launched a ‘colour supplement’ in the name ‘Jackie Oates’ and tagged ‘for traditional folk’ and folk pop artist David Owen immortalized her as a newly imagined ‘Jackie O’ for the 21st century. Jackie also toured with folk star Seth Lakeman the same year. 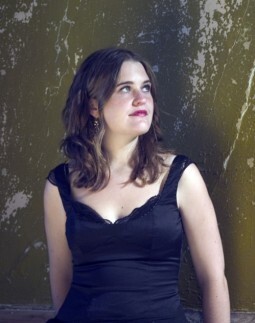 In September 2011 Jackie Oates released her fourth studio album titled ‘Saturnine’, produced by Richard Evans, released by ECC Records and featuring contributions from Jim Moray, Karen Tweed and The Claque. Now a major name in the English folk scene, Jackie followed the release with a major round of touring in the UK and abroad and a packed season of festival appearances, with sales of Saturnine eclipsing those of her previous albums. In 2012 she began an extensive period of research into an area of song that is particularly close to her heart: lullabies. Collating material for England and beyond into a new collection to be house at the Vaughan Williams Memorial Library at Cecil Sharp House in London. In autumn she went into the studio with producer Richard Evans and musicians Belinda O’Hooley and Chris Sarjeant to record a selection of the material for a new Lullabies album that was completed with works recorded by Richard and Jackie during a trip to Reykjavik in Iceland in November just days before the album was finalized. The album ‘Lullabies’ will be released on 18th March 2013 by ECC Records and followed by two Lullabies tours in April and October 2013.